Canaccord Genuity Wealth Management Jersey Half Marathon 2019. Sun 9th June 2019. I agree to my details being passed on to JSAD for them to contact me in the future, about the important work they do. 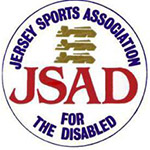 JSAD is a charitable organisation and was formed some 25 years ago with the purpose of providing support and encouragement to local residents with a disability who wish to take part in sport. It was, and remains, the general ethos that sport should be available to all, regardless of age or disability, and be fun!